“They must be state of the art, know what’s ethical, what’s legal and what’s efficient. They need a stern and discerning eye, but also a good sense of proportion by not asking for too much in regards to security from not so well-off institutions. Resolution and diplomacy are likewise important skills.” This is how laudator Susanne Kähler, professor for Museum Studies at the HTW Berlin, outlined the occupational profile of the registrar. The association Registrars Deutschland e.V. was founded 2004, one of the reasons being to actively raise awareness and understanding for the work and the significance of the registrar in museums, collections and exhibitions. In the meantime, the association has more than 140 members who meet for annual assemblies, workshops and further trainings. Networking is done on an international level. Part of a registrar’s job is everything that has to do with the movement and storage of artworks and cultural heritage inside and between museums. Furthermore, the occuptional profile encompasses transport, (inter-)national loans, packing, documentation and registration, as well as cataloging, security and insurance – registrars are perfect managers of time and data (Kähler). In Germany, registrars are known for over 30 years for a wide range of manual, technical, commercial and legal processes regarding the handling of artworks and cultural objects of all kind. In spite of this central function this professional guild is working comparably invisible inside the cultural institutions. 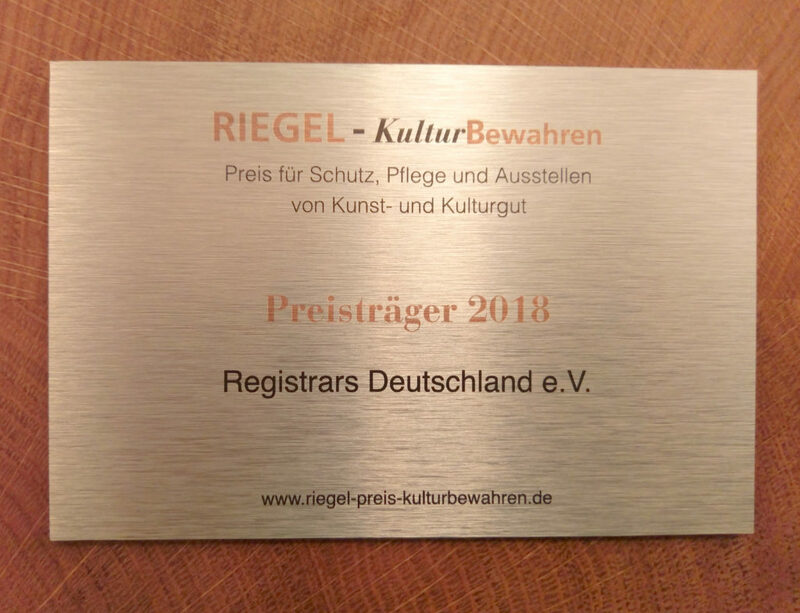 The award Riegel – KulturBewahren is aiming to make a contribution to foster understanding for the work and significance of the registrar. One of this aims is to develop commonly approved standards and enforce them throughout the area of responsibility of the registrar. Volker Thiel and Nicole Schmidt, chair and vice chair of the Registrars Deutschland e.V. have accepted the award and the 2,200 Euro grant on behalf of the registrars. Both were clearly moved by the attention and recognition that the award Riegel – KulturBewahren means. Around 70 experts from museums, associations and businesses took part in the awarding ceremony at the Bach-Archiv in Leipzig. The event on the 8th of November was part of the 5th international conference “KULTUR!GUT!SCHÜTZEN! Sicherheit und Katastrophenschutz für Museen, Archive und Bibliotheken” (Culture!Property/good!Preserve! Security and emergency preparedness for museums, archives and libraries). There are many awards for creating artworks. But when it comes to preserving mobile art and artifacts there is next to nothing comparable in Germany and Europe, at least no awards that go along with a grant. It is the aim of “Riegel – KulturBewahren. Preis für Schutz, Pflege und Ausstellen von Kunst- und Kulturgut” (The Lock Bar – Preserving Culture. Award for safeguarding, caring and exhibiting of art and cultural heritage) to change this. The “Riegel” was first awarded in 2016, the minimum grant is 500 Euro. 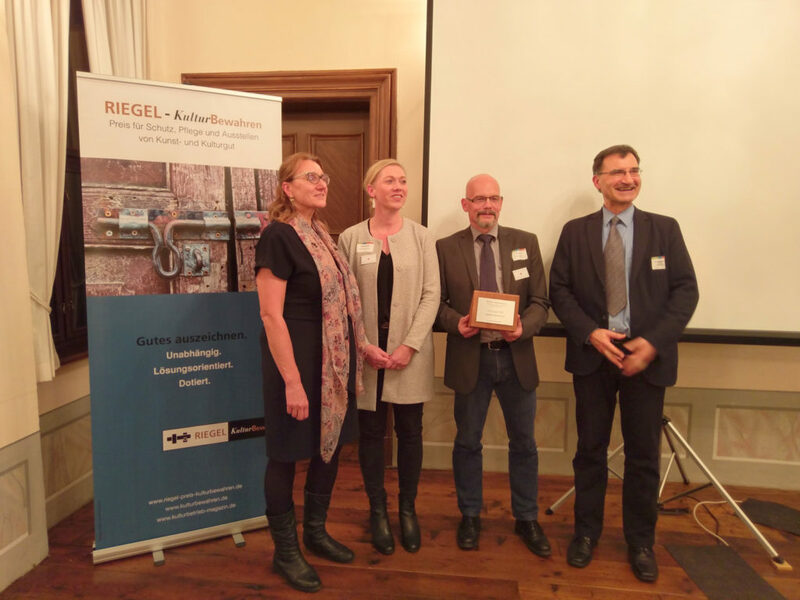 The awarding of the “Riegel – KulturBewahren 2018″ is a common initiative of SiLK – SicherheitsLeitfaden Kulturgut (security guideline for cultural heritage), Bundesamt für Bevölkerungsschutz und Katastrophenhilfe (Federal Office for Civil Protection and Disaster Assistance) and SchmittART. The award itself is an initiative of the professional periodical “KulturBetrieb. Magazin für innovative und wirtschaftliche Lösungen in Museen, Bibliotheken und Archiven” (Culture business. Periodical for innovative and economical selutions in museums, libraries and archives) and the online portal “KulturBewahren. Forum für Bewahrung, Pflege, Sicherheit und Präsentation von Kunst- und Kulturgut” (Preserving culture. Forum for preservation, caring, safeguarding and exhibiting of art and cultural heritage) .